James "Jim" Germann passed away peacefully November 14th 2016 in the loving arms of his 3 devoted children. Jim started his life on a farm in northern Kentucky, the second youngest of eight children. His family bought a grocery store I Georgetown, Ohio where all of the children took turns working. After high school, he joined the Army and served in Bremen, Germany in an infantry unit. After the war, he moved to Berkeley, California with his ant Abbie Stuart for about a year before moving to Portland, Oregon to enjoy the great outdoors. It is there that he met and married the love of his life, Ann Catherine Repetto. 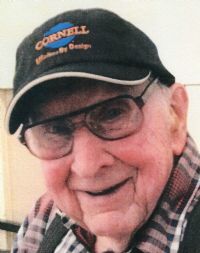 They moved into their home in Sellwood/Moreland in 1956 and ended his long and successful career in the retail industry with his retirement in 1986. His real passions were hiking, camping, and working with flowers. He spent much of his retirement gardening, donating plants and dried flowers to the St. Agatha Christmas Bazaar every year, and showcasing his vibrant yard which brought joy to the entire neighborhood. His greatest legacy was to devote his retirement to be of service to others. He was a member of the St. Agatha's parish, St Vincent DePaul, and the Knights of Columbus, attending meetings and keeping minutes up until just a few months before his death. He worked to deliver emergency food boxes, serve dinner at St Francis Dinning Hall, serve coffee and doughnuts to parishioners, rive parishioners to church, volunteer at the Down Town Men's Chapel, and was always there to lend a hands to whoever needed him.